My wife, sat drinking coffee, and wearing a quilted jacket. If you were to pick the most revolutionary recent peripheral, chances are that you would pick 3D printers. Wonderful though they are, for the time being at least they are likely to remain a minority pursuit. 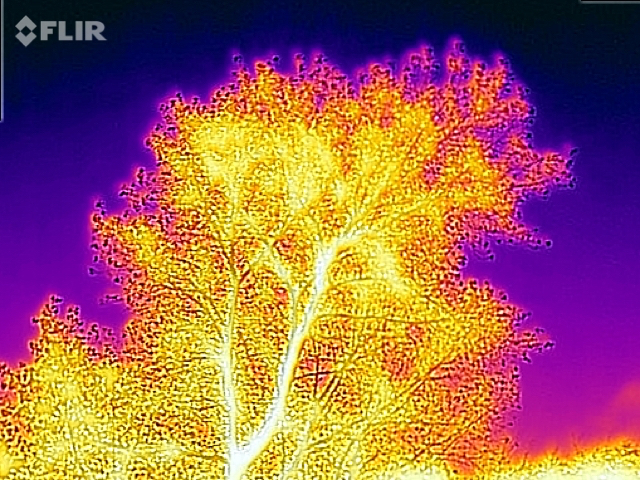 I suggest a much better candidate is the FLIR One™ infra-red (IR) camera for iOS. I started using infra-red thermography professionally back in 1982. At the time my boss, the late and great Dr Frank Golden, was looking for ways to assess UK military personnel who had sustained cold injury – ‘trench foot’ – during the Falklands Conflict. One method involved making IR images, in those days using a 256 x 256 pixel greyscale camera system, which was huge, drank liquid nitrogen, and cost over £50,000. When I took over from Frank in 1987, we already had a much better IR camera, and progressively upgraded and downpriced until the last camera which I selected a couple of years ago, offering far higher resolution for around £15,000. In recent years we used exclusively FLIR® cameras, which most would agree are the best on the market. 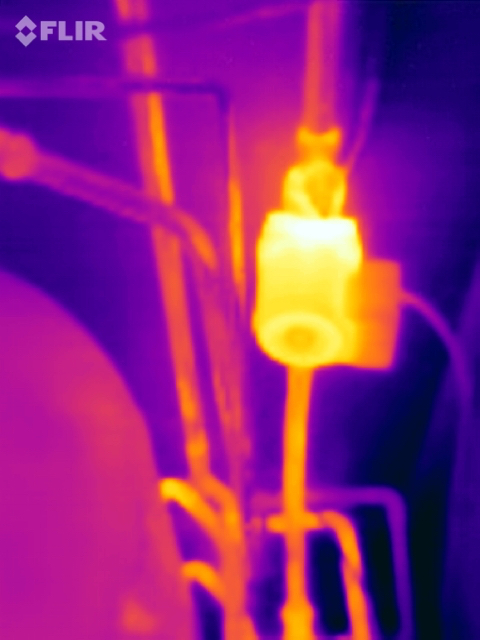 IR thermography may seem a very unusual technique, and when cameras were so expensive it was set to remain so. But yesterday I bought my own IR camera which far out-performs many older models, for less than £200. Mains electricity supply (domestic) with meter and main panels. 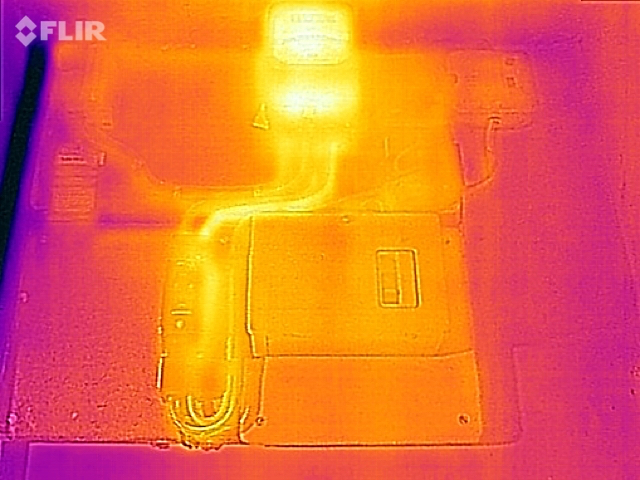 The FLIR One™ plugs into the Lightning port on any recent iOS device, iPhone or iPad. It has its own rechargeable internal battery (charged via a USB cable), with a Lepton™ long-wave IR camera delivering a resolution of 160 x 120 pixels, and a visible light camera, built in. The IR image is mixed with an edge-detected visible image and interpolated to produce high quality 640 x 480 IR images, as well as movies, panoramas, and more. Currently in the UK the latest improved version costs around £199.95 from Apple stores and the FLIR® store on amazon.co.uk. In the US, you should pay less than $250.00. If you must, FLIR One™ is also available for Android. The FLIR One™ is, I think, a unique input device in that it enables your iPhone/iPad to sense something that your body is unable to. I will explain in more detail in future articles how IR thermography works, but suffice it to say here that it measures long-wave infra-red radiation emitted by surfaces, which is a very accurate measure of temperature. Although our eyes are wonderful at sensing (and our brains at processing) visible light, we cannot see IR emissions. This device enables you to. A domestic heating pump and pipework. investigating engine faults of various types. FLIR® has an active developer programme which has already resulted in several third-party apps supporting the FLIR One™. I was delighted to see that one of their own forthcoming apps uses a technique which I suggested to them a couple of years ago, enabling the automatic separation of areas of interest from background using an optical ‘green screen’ image. A tree seen against a cold sky. As I have only just bought my FLIR One™ IR camera, I can only confirm that it comes up to expectations, and offer these initial images as evidence. For now, I am still amazed at its price and performance: under £200 for what would have cost over £50,000. That really is putting a powerful enabling technology in the hands of many users. Posted in General, Macs, Painting, Technology and tagged camera, FLIR, FLIR One, imaging, infrared, iOS, IR. Bookmark the permalink.